When is a canyon too big? When is a park too one dimensional? There are many canyons in different National Parks. The grand daddy of them all is the Grand Canyon, but there is also the Grand Canyon of Yellowstone, the Black Canyon of the Gunnison, and Zion Canyon, just to name a few. Just because Grand Canyon is the biggest and the deepest, does that mean it’s the best? Canyonlands is the best National Park with a canyon focus. This park offers more variety than Grand, Black or Zion canyons and it’s much less crowded than Grand or Zion. 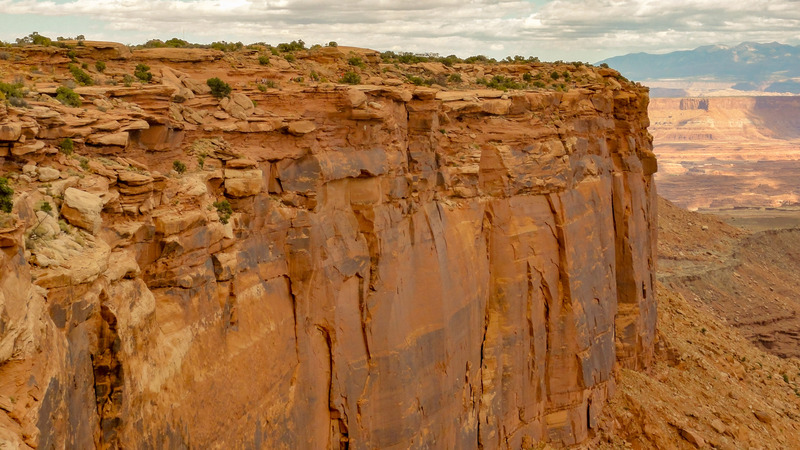 Canyonlands is big, but the canyons are more human scaled. The canyons are formed by the Green and Colorado rivers as these two rivers merge. This creates a much more interesting view than a single river canyon. The scenery is on a scale that is more relateable. The canyons formed by the Green and Colorado rivers have sheer cliffs that make your knees wobbly but there are also tiered rims for a more interesting, complex look. While the canyons are not the largest, it’s large enough to be awe inspiring. The air here is clean enough most of the time for a crystal clear view of the other side and the river below. 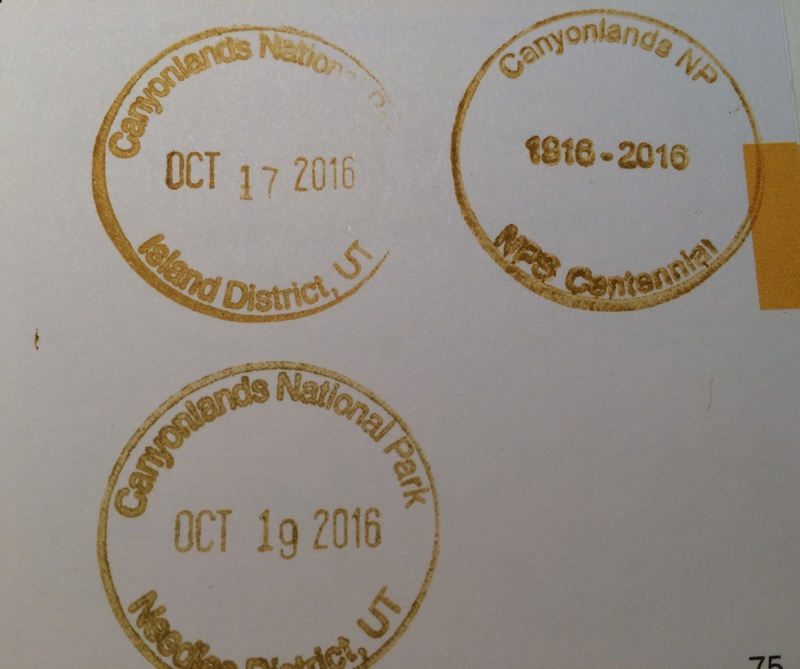 Canyonlands has three distinct sections. Island in the Sky is the most accessible part with good paved roads that lead to great hiking trails and viewpoints. There are many pullouts with short hikes for views from multiple vantage points. 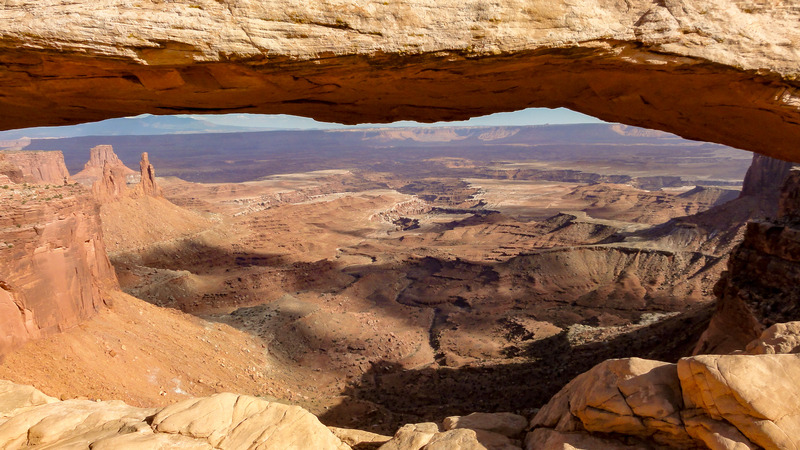 It’s relatively close to Moab, the gateway city for Canyonlands and Arches. The Needles area has good paved roads that lead to good hiking trails and good scenery, but getting to it requires a long drive. The Maze section is accessible only with four wheel drive vehicles and has limited services. It’s for those who like to rough it. The highlight of Island in the Sky district, and the entire park, is the Grand Viewpoint. This viewpoint overlooks the confluence of the two rivers that shape the canyons over millions of years as they erode the limestone rocks to form the deep Y shaped canyon. The canyon has two tiers. White Rim is 1200 feet below the Grand Viewpoint. The rivers are 2000 feet below the White Rim, for a total drop of 3200 feet. While you can get a good view from viewpoints near the parking lot, the truly spectacular view requires a two mile round trip flat hike. The Grand Viewpoint Trail is like a peninsula that juts out, with 1000 feet vertical drops that flank the trail before reaching the tip with a sweeping 300 degree view of the canyon below. Standing at the tip reminds me of the scene from the movie Titanic when Leonardo DiCaprio stood at the bow of the ship with wind blowing in his hair. It simply feels great. Mesa Arch is as interesting an arch as you will find anywhere. This arch frames the canyon backdrop perfectly to create great photographs. It offers a rare tops down perspective looking through an arch. Photographers line up at sunrise to film the sun coming over the arch. This sight is well worth the half mile round trip hike with a bit of elevation change. Canyonlands is more than canyons. Geologists still can’t agree on how Upheaval Dome, a crater like formation, was formed. Some say it was formed from a meteorite while others say it was formed from a rise in ancient ocean floor. Regardless of how it’s formed, the scene feels like Mars. Very surreal. The first viewpoint is one mile from the parking lot. A second mile of hike affords a view of the same crater from the other side. Both viewpoints are about the same. 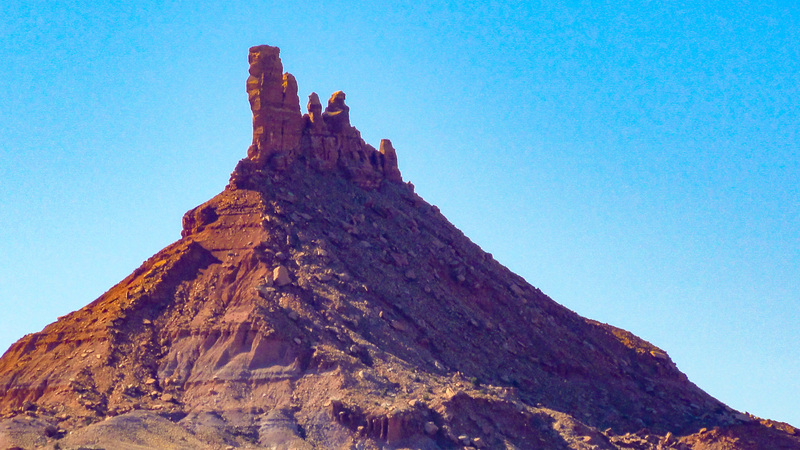 The Needles district requires a long drive from Moab with no services along the way. Before you go, make sure you have enough gas in the tank, plenty of water, and food. You will find solitude because most visitors will not take the trouble to drive there. Many scenes along the drive look like they came right out of a western movie… wait… maybe it’s the other way around. There are four short hikes that are easy with variety. Roadside Ruin and Cave Springs show off Pueblo and cowboy cultures respectively. Pothole and Slickrock trails offer great views of the Needles area with short hikes. Other long, strenuous hikes lead to the river below that require overnight camping. Those are beyond our ability. 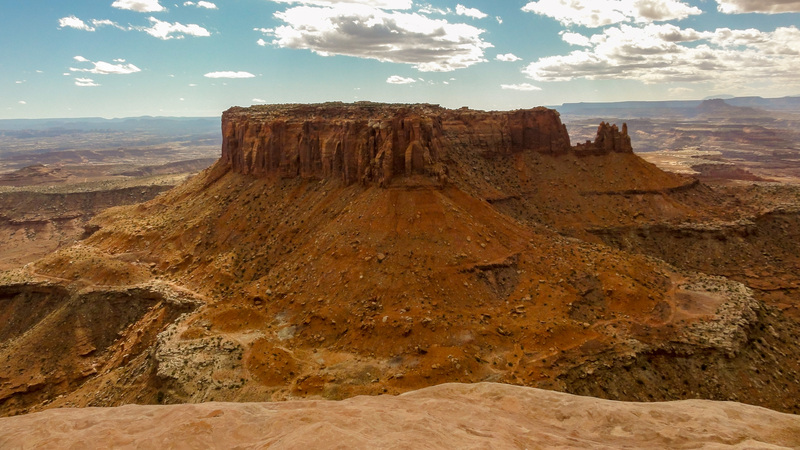 Four wheeling is very popular at Canyonlands and the surrounding area because of great trails like the White Rim Trail. A Four wheel drive vehicle gets close to the river and offer a different, close up view from the mid-tier of the canyon. Of course, they are fun just to ride. Many outfitters in Moab offer Jeep rentals and escorted tours for those with less brittle bones to enjoy off-roading adventures. Bigger is not always better. Just like the canyons of Canyonlands feels more relatable, size needs to be appropriate. Be clear on the goals to determine the right size in whatever you do. Canyonlands is the opposite of Arches National Park next door. Arches is compact, Canyonlands is vast. Arches is crowded, Canyonlands provides solitude. 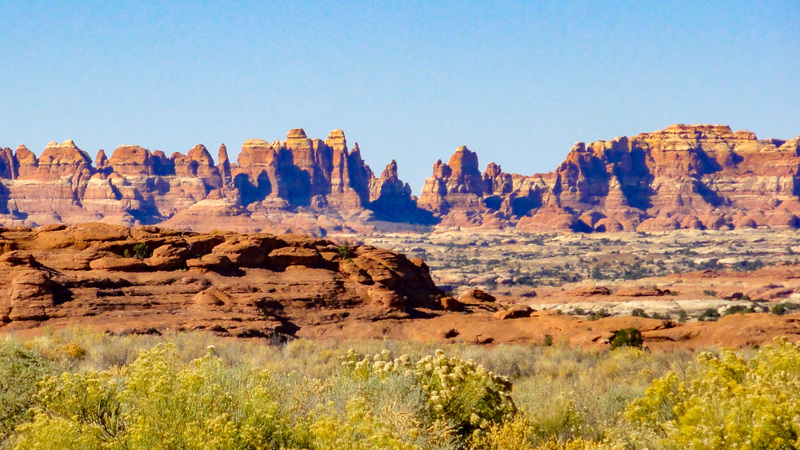 Arches has specific interest points, Canyonlands has grand vistas. Sit at the edge of the cliff. Look down on the confluence of two mighty rivers. Feel the gentle breeze. See the brilliant red color reflect from the sandstone walls. The experience is peace and solitude. This is the perfect setting for contemplation, reflection, and prayer. There is more “work” to visit Canyonlands, but the rewards are well worth the extra effort. Have you visited Canyonlands National Park? Leave a comment below on your experience. One day is not enough to visit more than one district. For one day only, visit the Island in the Sky district. Drive back and take the Green River Overlook spur. Stop at Green River Overlook and take the short walk to the view point. Head towards Mesa Arch and hike the short trail to the arch, if you did not stop here already. Head towards Grand View Point Overlook, but stop at Buck Canyon Overlook and Orange Cliffs Overlook. Park at Grand View Point Overlook and take the Grand View Point trail to the end. If time allows, exit the park and stop at Dead Horse Point State Park (separate fee) and admire the bend in the Colorado River. Moab is the gateway to the Island in the Sky portion of Canyonlands. Plenty of services in Moab. Needles section offers even more solitude but it’s a couple of hours of driving from Moab. It’s interesting to spend a day (not counting travel time) to hike the trails. Don’t try to visit Island in the Sky and Needles in one day. There isn’t enough time. The Maze is remote. Only visit if you have four wheel drive and want to do backcountry hiking and camping. White Rim trail looks interesting if you have a four wheel drive vehicle. 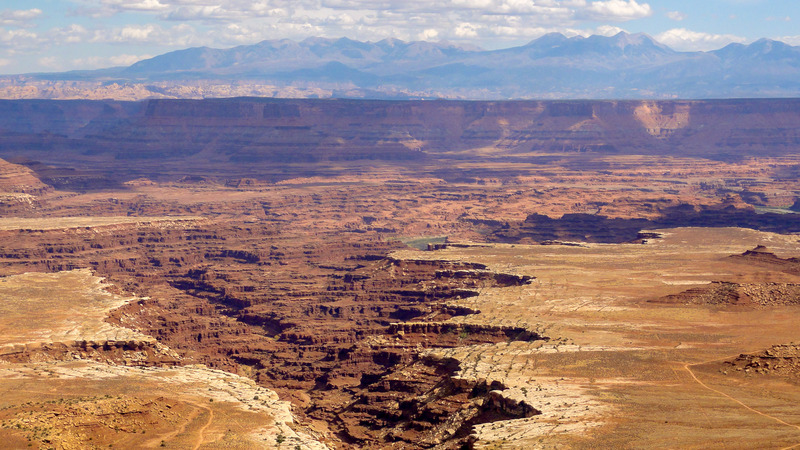 Four-Wheeling is a popular attraction at either Canyonlands or nearby recreation areas. Many outfitters provide rentals or tours in Moab. For the more sedate, take a Colorado river boat tour, especially at sunset. The river is calm like a lake. No rapids in this section. The rock cliffs in late afternoon are bright and colorful. Visitors: 742,271 in 2017, ranked 26th. Record is 776,218 in 2016. Peak Month in 2017: May with 107,756 visitors. Low Month in 2017: January with 7,434 visitors. Entrance fee: $25 per vehicle or $10 per person with no car.